On March 30, I posted a version of a story that was a work-in-progress for the monthly Word Sprout Story Slam. The story, Puzzles was selected to be featured on Freshly Pressed. That resulted in a lot of attention, as you can still tell by the number of comments on the post. However between the time I published the story and the time I performed it, I made significant changes to cut the story down to the required five minutes or less for performing at a slam – changes that made the story better. More focused. to share the revised version of the story. It is useful for anyone who thinks stories just spring whole from the head of the teller to see what goes into tightening them. A comment from Charli Mills (who runs a Friday Flash Fiction Challenge on her blog, Carrot Ranch Communications) was helpful in that revision. The story came in second place, after Heather Baldwin, whose interview was posted here last week. That means I will qualify for the Semi-Finals in June. Meanwhile, I’m working on my story for this month’s theme, Provoked. Which (gulp) is this Tuesday. Here, then, is Puzzles: The Slammer’s Cut. She hosted me; that was a first. The next day we got on a plane and headed to the small town in New York where I grew up, and where my parents live now. My dad had turned 85, and there was going to be a party. But it was my mother I was anxious to see. My mother doesn’t stumble on Maggie’s name. She looks almost normal. Her hugs seem different, somehow. More crumply. My sister warned me she might cry, but she doesn’t. We go out to dinner at The Cracker Barrel. Then we come home, and attack the puzzle. 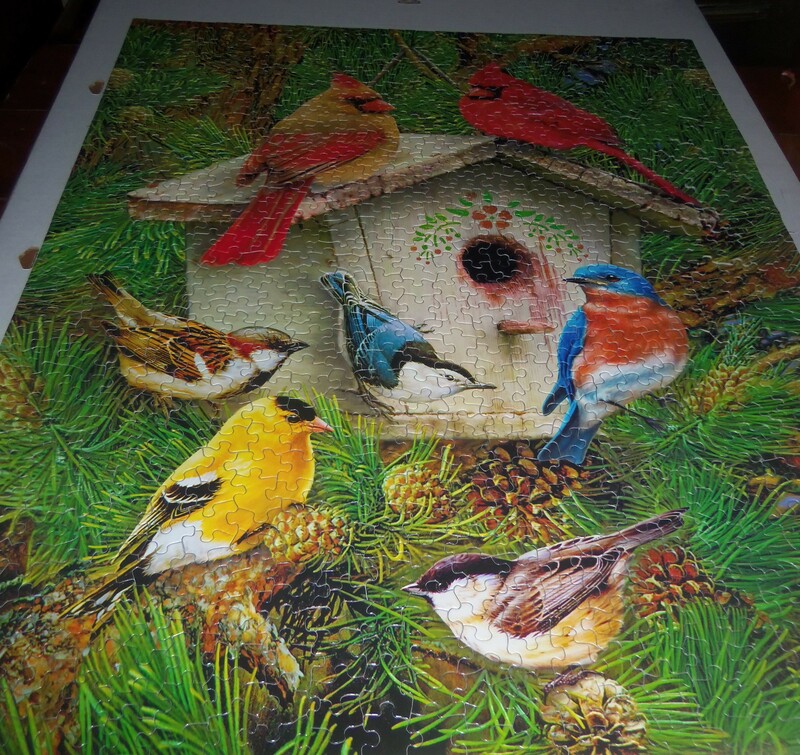 It has five hundred pieces, and it has been on the dining room table for over a month. On the phone I joke with her – “OK, Mom, let’s play 20 questions!” It’s like her mouth has become a vending machine, and the words get caught in the spirals. But when we make it a game she plays along. My mother used to be able to tell all the birds apart: the cardinals, the waxwings, the bluejays. Soon they’ll all be birds, like the leaves are all leaves. At least not the spatial kind. My puzzles have always been around getting the words right, getting the images right, witnessing to the texture and complexity of human experience, getting the story down. Now I am trying to look at what happens when a person I love – who was literally the start of my story – stops being able to do that. Am I that courageous? I do not know. Once or twice Maggie finds a piece or two in my mother’s pile – “do you think that goes over there?” and my mother is as delighted to fit those pieces in as if she had found them herself. And then, sweet Jesus, she does find a few. I sit with my back to the rows and rows of books on shelves that line one side of the room, as if it were a library. My mother’s library. My dad believes in reading the news and the comics, though both are hard for him now. But he wanted to show off all the books my mother had read, so he had the bookcases built. My mother’s summers as a school teacher were filled with books; I got my love of reading from her. When they retired, and the traveling began, my father’s souvenirs went on the refrigerator; my mother’s went here. “You’ve read so many books, Mom,” I say as we head into the living room for the evening ritual: wine and snacks and news. “What are you reading now?” She pretends not to hear me. Paula, this was absolutely breathtaking. I was able to live through your pain through the words you chose to convey this sad disease through. I was able to look through your eyes and envision you all sitting there, piecing the puzzle together… as though you were holding onto the last few pieces of your mother’s scattered memories. My favorite part was when you wrote, “At least not the spatial kind. My puzzles have always been around getting the words right, getting the images right, witnessing to the texture and complexity of human experience, getting the story down.” Beautiful. My, you do have a way with words. Thank you, Gina. I think one of the things my mother is teaching me now is that sometimes you have to let the story go. It’s not an easy lesson, but I’m trying to pay attention. A powerful piece of writing, Paula, and your controlled emotions make it more moving & poignant than if you’d expressed what you are undoubtedly feeling. Although the bits you cut out were relevant, this tighter version narrows the focus, so when you read it, you hone in on the humanity that’s the essence of this sweet sad story. This so moving Paula as much for its understatement as Teagan alludes to, as its ability to highlight the slow on-going loss from both sides. People are often unaware that a person with dementia is only too conscious of everything crumbling away from them. And that this is too hard to keep confronting – the kind thing sometimes is pretending not to hear. I confess to not having read the longer version but this felt complete to me and as I had my tissues out at the end trust you’ll do well in June. Thanks so much Lisa. And for all the shares on Twitter. It’s been a busy week! Wow, Paula! That is a beautiful piece, full of vivid observations. Made me think about how what we pretend not to hear is just as important as what we say to each other. I read your piece and wound up staring out the window for several minutes. Brought back to focus as a bird began chirping. Thanks for sharing this! Thank you, Tui. It’s nice to know the piece still works, even outside of performance. Especially since the story I’m contemplating for the next slam theme, “In the Dog House,” is something of a followup. So your comment comes at an opportune time. page and see how they write post titles to get viewers to click. Thanks, Madeline. I appreciate the feedback. This is a rather old post, and I’ve learned a little bit about titles (and blogging) since then. You write so well, Paula. I’m glad I got a chance to read your story.